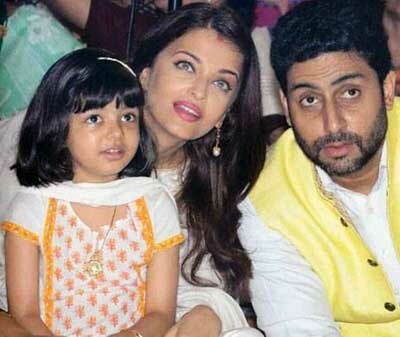 Will Aaradhya Daughter of Actress Aish Will Start Acting? There are gossip mill running faster around the Mumbai media sector, and this time it is about actress Aish, her husband and her daughter. As per reports they say that actor Abhishek wants their daughter Aaradhya to start acting in Bollywood movies as a child star if there are opportunities available, so she can become a Bollywood heroine in the future. But they say that the actress Aish is against his wish and want their daughter to have a normal child life without coming in to the stardom. on he rview money or fame is not important for her daughter while Abhishek wants Aaradhya to get more fame by taking the acting career in her early life. Because of these views tabloids and websites are running News articles as that both the actor and actress are fighting and arguing over their daughter's future. On the other hand there are rumors that the leading star couples are going to cast in Anurag Kashyap’s romantic comedy named as "Ghulab Jaamun". So far there are no reports available from the Abhishek family home about the new movie or related events on this movie. This star couple had worked together in Guru, Umrao Jaan, Sarkar Raj and Dhai Akshar Prem Ke. 7 year back they worked together in Mani Ratnam's 'Raavan'. Actress Aishwarya Rai, 43-year-old actress has been honored with the best actress award for her performance in the movie 'Sarbjit' at the International Film Festival and Awards of Australia (IFFAA). All over the world Actress Aish received huge recognition for her acting role in this movie.